For people in parts of Herbert and Lower Burdekin and Central Coast and Whitsundays Forecast Districts. Issued at 4:59 pm Sunday, 6 January 2019. Weather Situation: At 4pm AEST Sunday, ex-tropical cyclone Penny was located in the Coral Sea near latitude 17.0 degrees south, longitude 154.5 degrees east, about 740 kilometres east to northeast of Bowen. Over the next few days, the system is forecast to move further west towards the tropical east coast of Queensland, most likely as a tropical low. There is still some risk that the system will redevelop into a category 1 tropical cyclone over the western Coral Sea. However, regardless of its status, heavy rainfall and damaging winds are likely to develop with its passage. Areas of heavy rainfall, which may lead to flash flooding, are expected to develop over the southern flank of the system from Monday evening. Heavy rain should initially develop about coastal areas between Alva Beach and Sarina, and extend inland during Tuesday. Six hourly rainfall totals between 140mm and 180mm are possible, with isolated heavier falls in excess of 200mm possible. Damaging winds, with peak gusts of around 90km/h may develop over the Whitsunday Islands from Monday evening or Tuesday morning. Locations which may be affected include Mackay, Bowen, Ayr, Proserpine, Collinsville, Hamilton Island, Eungella, Alva Beach, Airlie Beach and Clare. The next Severe Weather Warning will be issued by 11:00 pm AEST Sunday. Issued at 4:42 pm Monday, 7 January 2019. Heavy rain and damaging wind gusts expected to develop between Alva Beach and Sarina on Tuesday. Weather Situation: At 4pm AEST Monday, ex-tropical cyclone Penny was located in the Coral Sea near latitude 18.1 degrees south, longitude 152.6 degrees east, about 630 kilometres east-northeast of Townsville. Ex-Penny was moving west southwest at 14 kilometres per hour. Ex-tropical cyclone Penny is expected to continue its westward movement, and the system is likely to cross the tropical Queensland coast some time between late Tuesday and early Thursday. The most likely scenario is that ex-Penny will remain a tropical low, but there is a moderate risk that the system will redevelop into a category 1 tropical cyclone before it crosses the coast. Regardless of its status, heavy rainfall and damaging winds are likely to develop about parts of the Queensland coast as ex-Penny approaches. Areas of heavy rainfall, which may lead to flash flooding, are expected to develop in coastal and adjacent inland areas between Alva Beach and Sarina on Tuesday. Six hourly rainfall totals between 140mm and 180mm are possible, with isolated heavier falls in excess of 200mm. Damaging winds, with peak gusts of around 90km/h, are expected to develop about exposed coastal and island locations in the warning area on Tuesday, particularly about the Whitsunday Islands. Locations which may be affected include Mackay, Bowen, Ayr, Proserpine, Collinsville and Hamilton Island. Nice to see you are getting a drink in Mackay Tempest. It managed to just miss here. I'm south of you nowadays mate. Quite happy with my 76.2mm.  So missed this! oh, I thought you were up in Cairns, in saying that, this is our last wet season in Mackay, we are moving to Brisb this year. Near Bundaberg on the coast mate. Conway Beach this arvo - white horses galore. Penny has given us 145mm so far, cant complain. 550mm since the start of Dec, good start to the wet. The GFS model has been consistently showing an active moonsoon trough developing at the end of this month, looks promising. Issued at 9:10 am Sunday, 27 January 2019. High risk of heavy rain and flooding across areas of north Queensland during today and into tonight. 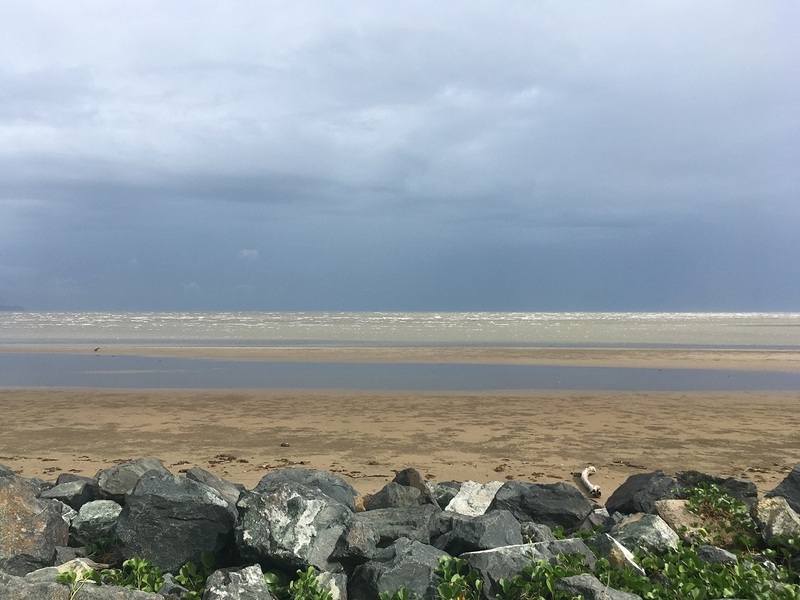 Weather Situation: The monsoon trough currently extends across far north Queensland and is forecast to shift slowly southwards over north Queensland during today. Heavy rainfall, which may lead to flash flooding, is forecast around the tropical east coast and adjacent inland areas between Cairns and Bowen today. Six-hourly rainfall totals of 100mm to 150mm are likely with locally heavier falls possible with thunderstorms. LOCALLY INTENSE RAINFALL AND FLOODING will remain a risk during today and into tonight with six-hourly rainfall totals in excess of 250mm possible. Heavy rainfall may extend southwards towards the Whitsundays and adjacent inland areas on Monday. Depending on the movement of the monsoon trough. It is possible that this heavy rainfall may extend a little further south than currently forecast. 5 registered (crikey, Dan101, LonnyDave, Adaminaby Angler, Steve O), 61 Guests and 3 Spiders online.